1. Change Your T-Shirt - take responsibility for your own life and don't be a victim. 2. Develop Fruity Thinking - change your thinking and change your results. 3. Hippo Time is OK - understand how setbacks affect you and how to recover from them. 4. Remember the Beachball - increase your understanding and awareness of other people's world. 5. Learn Latin - change comes through action not intention. Overcome the tendency to put things off. "A superb book. It combines honesty, humour and inspiration to help people move ahead in life." "Powerful, simple and effective. A highly engaging and thought provoking book. Anyone who reads it is sure to look at themselves and the world differently as a result." The S.U.M.O. guy is Paul McGee, an international speaker and author. He has been developing the S.U.M.O. principles over the last five years. 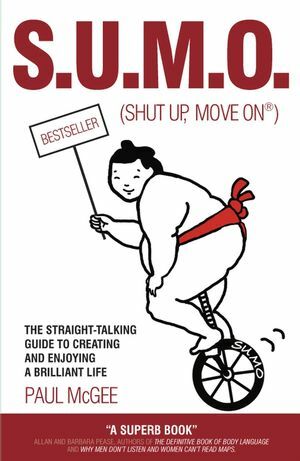 PAUL McGEE is an International Speaker, workshop leader, author of books and audio programmers, and proud creator of SUMO (shut Up, Move On®). Paul;s main aim in life is to help others SUMO, whilst having plenty of fun in the process. He has spread the word about SUMO in 20 countries across the globe. Paul has also worked with major organizations in both public and private sectors world wide. Paul is founder member and fellow of the Professional Speakers Association, a fellow of the Institute of Sales and Marketing and an associate of the Chartered Institute of Personal and Development. 3 Hippo Time Is OK.
Want to Know More About SUMO?